Keep bread making easy with the SKG Automatic Bread Machine! If you love bread like we do, can you imagine anything better than a freshly baked loaf of bread? That golden crust, the fragrance of warm bread, and most importantly – the delicious, mouth-watering taste of freshly-baked bread takes us back. If you ask me to give you a list of life’s greatest and simplest pleasures, I would put waking up to freshly-baked bread at the top of that list. Unfortunately, few of us are lucky to experience it on a regular basis! Sure, you may consider a career change by starting life anew as a local baker. But luckily for you, there is a much easier and a more practical way to experience the smell of fresh bread, and that is baking your own bread at home using a modern bread maker. Today’s modern bread makers have come a long way from the break makers of even a decade ago. Modern baking machines can bake gluten-free bread, make loaves of different sizes and shapes, and some even have options to add various ingredients like nuts or raisins. 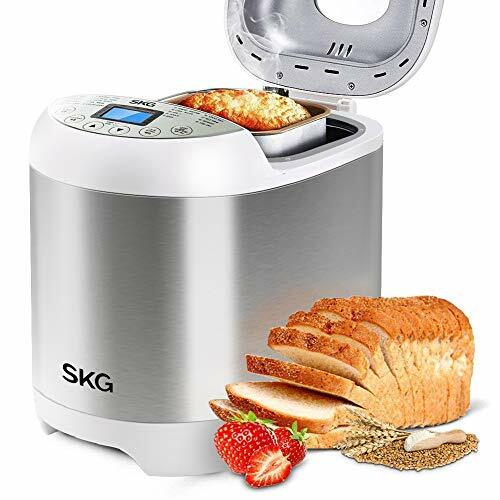 The SKG Automatic Bread Maker is one such modern automatic bread machine. Lets take a look at it..
2-year warranty for parts and accessories! The SKG Automatic Bread Machine has so amazing points to talk about we don’t know where to begin. If you’re already familiar with bread makers or have one in your kitchen, you’ll agree that the SKG has the most comprehensive programmable settings of any current bread machines out there. The SKG comes with 19 different program settings which include French, basic, cake, gluten-free, cornbread, yogurt, jam, and many more. Furthermore, there are 3 different loaf size options with 3 different crust colors. Use these settings to bake light, medium, or dark bread in three different sizes. Besides, these settings are really useful if you’re looking forward to making that perfect loaf of bread for the first time. The SKG Automatic Bread Machine is fully automatic and highly programmable. The SKG has a 15-hour delay timer, which means that you can set this machine in the morning before leaving for work, and a warm, tasty loaf of bread will be waiting for you when you return. In addition, there’s a 1-hour “keep warm” feature that keeps your bread warm when you’re not around. Beyond this, the SKG bread machine has a “15-minute power interruption recovery” option will keep your bread fresh and warm. The SKG Automatic Bread Machine is also sleek, compact, and has an incredibly modern design. Weighing at around 10 lbs and around 15” inches in height, storing this machine in your kitchen cabinets or on your countertop won’t be a problem. Also, the machines’ blend of piano varnish in silver color will fare well with any kitchen décor. Some customer said customer service is mediocre. The SKG Automatic Bread Maker has amazing customer reviews. This automatic bread machine scores 4.6/5 stars based on over 300 customer reviews. Can you make pizza dough in this machine? Does this bread machine make hamburger buns? Are there any that makes one? Answer: Unfortunately, no. Bread machines are designed to bake regular loaves of bread. Can this machine make gluten-free bread? Answer: Yes, you can great, gluten-free bread with the SKG Automatic Bread Maker. Can you make yogurt in this machine? What are the measurements of the bread pans? Answer: The bread pan is about 6 1/2 inches tall. What sizes of bread does the SKG make? Answer: It makes 1, 1/2, 2-pound loaves. Does this bread machine have a beeper to let me know when to add raisins or nuts? Answer: Yes, it has a beeper. Overall, the SKG Automatic Bread Maker is not a perfect bread maker. There are advantages and disadvantages. But, the downsides of this bread maker are negligible, to say the least, and in no way affects the performance of the machine. It’s a great appliance compared to its price. The great design, the 19 baking settings, attractive and useful features, and a 2-year warranty, honestly, we don’t have much to complain about here. I would highly recommend this machine if you want to make great, quality bread at home for an affordable price.